Based in Fulham, London, is Chelsea Football Club who are currently active in the Premier League and have remained a top tier club in English football since its inception in 1905. 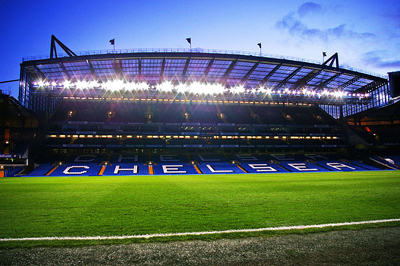 They have remained at their current home grounds at Stamford Bridge stadium since the club was established. The grounds are in a great location for fans to visit due to the proximity of various train and road links. Gus Mears was the founder of Chelsea FC in 1905, and the club was owned by his family until 1982 when Ken Bates bought the club out for just ₤1. Fast forward to 2003 and the club was purchased by the Russian billionaire, Roman Abramovich, who still owns the club today. Although there has been changes in ownership over the years, the things that have not changed are the nicknames fondly known by the fans of the club which are "The Pensioners" and "The Blues". Chelsea Football Club has only ever had one home location for its stadium and that is at Stamford Bridge, which is located in the borough of Fulham within London. It was in the 1970s when the original owners of the club announced the expansion of the stadium to modernise and increase its capacity. Unfortunately, the cost of expansion almost brought the club to bankruptcy. The stadium's renovation was then resumed during the era Ken Bates when he owned the club, as well as some other redevelopments to the stadium, which included a megastore, restaurants, bars and hotels which were collectively known as the "Chelsea Village". In the takeover of 2003, the current owner, Roman Abramovich made the decision to cease operation of Chelsea Village as it wasn't financially sound. Currently, the stadium boasts all seated stands in the north, south, east and west sections, with the capacity to seat 41,837 people. There has been the need to increase the capacity of Stamford Bridge stadium to compete with rival clubs such as Manchester United and Arsenal who have much larger stadiums than Chelsea. Expansion is proving to be an uphill struggle due to the overdeveloped location of the stadium. The crest has undergone several changes over the long history of the club. The original crest named "The Pensioner" was the club's emblem for around 50 years. It was in 1953 when the most well known crest was created and then used for over 30 years, where upon it received an alteration in design and colours which remained until 2005. 2005 marked the return of the 1950s crest by request of the fans and to also mark the centenary of the football club. Chelsea's history is basked in success and has remained one of the most successful clubs in English football. It was 1955 when the club had their first true taste of success by becoming the league champions. This was followed by a series of victories across many competitions and the club won various cups during the period of 1965 to 1990. During the last 20 years, the club has possibly enjoyed their greatest period of prosperity. Chelsea has won 17 trophies from major events since 1997, while also boasting a plethora of other impressive wins both domestically and continentally. This includes the following victories. To put Chelsea's achievements into perspective, they are the only English club to have won all 3 of the main UEFA competitions. Like all football clubs, there are some intense rivalries, although most of Chelsea's rivals include the various other London clubs. The top adversaries include Arsenal, which are their closest rival, then Tottenham Hotspur a close second, and finally Manchester United. In more recent times, a distinct rivalry has brewed between Liverpool, mostly due to the various clashes both clubs have endured within cup competitions. Between the period of 1961 through to 1980, the ex-captain of Chelsea, Ron Harris, performed in 795 competitive games. Peter Bonetti was the goalkeeper for Chelsea from 1959 until 1979, and he played in 729 matches. Frank Lampard also holds the record for being the most capped player in international games. The top goal scorer of all time in Chelsea Football Club is none other than Frank Lampard. During 2001 to 2014, Lampard managed to score 211 goals spread over 648 games. Jimmy Greaves, however, holds the record for most goals scored in a single season, where he scored 48 goals during the season of 1960 to 1961. While Frank Lampard is the top goal scorer for the club, there are several other notable mentions that have all managed to score in excess of 100 goals throughout their careers within the club. These include, in order of appearance. The largest score achieved by Chelsea fc in a competitive game was 13-0 in the 1971 Cup Winners Cup against Jeunesse Hautcharage. The club also managed achieve 8-0 victories against both Wigin Athletic and Aston Villa in 2010 and 2012, respectively. Of course, there are going to be some losses, that's natural. The biggest loss in Chelsea's history was the 1953 match against Wolverhampton Wanderers, where the Chelsea lost the match 8-1. Demand for Chelsea FC Tickets is always highly sought after due to the popularity of the club and leagues they participate in. Therefore, fans of Chelsea Football Club should always ensure they grab their ticket's as soon as possible to avoid disappointment.